Jameson's 6' FG Series Yellow Hollow Core Saw Extension w/ Female Ferrule by Male Ferrule. Extension sections can be added to your head pole (either a saw section or pole pruner) to increase your reach to the desired height. The extension section are also used with Quick Change tools where the tool plugs into the female ferrule of the extension pole. 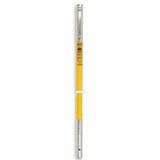 The hollow core FG series poles are lighter that the JE series poles yet offer exceptional rigidity. This series is our most popular pruning pole for the general arborist not involved in utility work. The FG series as well as all Jameson pruning poles incorporate a non-fiberglass exterior veil to prevent fibers from blooming to the surface.